Avant is an online lender that offers personal loans from $1,000 to $35,000, and one of the few lenders that provides loans to borrowers with bad credit. They requires borrowers to have a minimum credit score of 580, which is much lower than most online lenders. This makes Avant a very convenient lender for anyone with bad or poor credit, although the average borrower with Avant generally has a credit score between 600 and 700. Avant’s headquarters is based in Chicago, and their business model is to service personal loans to middle-class consumers. On average, their borrowers have an annual household income around $40,000 and $100,000. Although this is the average household income of their borrowers, Avant doesn’t have any minimum requirements for credit history, income, or the debt-to-income ratio. Avant does a “soft credit check” when you apply for a personal loan and check your rate. A soft credit check doesn’t affect your credit score when determining your rates. Borrowers generally receive their funds within 24 hours of being approved for a loan. Avant also gives their borrower with bad credit the opportunity to approve their credit score. They report loan payments to all three of the major credit bureaus each month, meaning anyone with bad credit who makes regular timely payments on their loan can greatly improve their credit score. 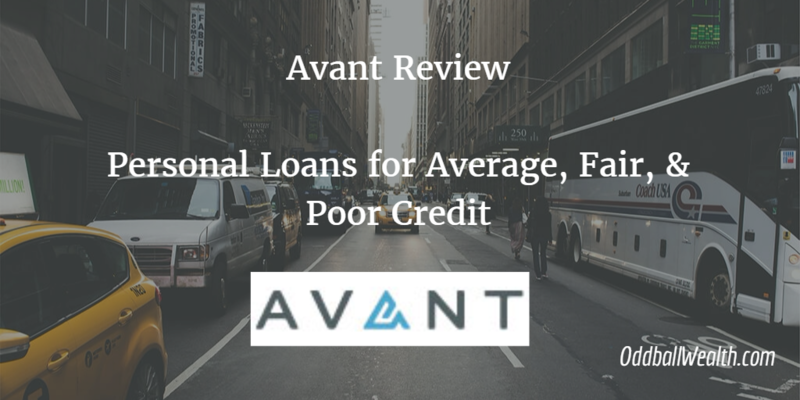 There are a couple reason Avant is different from other lenders, one obvious reason is the fact that they provide loans to borrowers with bad or poor credit. They also do not charge an origination fee and provide fast funding, borrowers generally receive their funds within 24 hours of being approved for a loan. They have flexible loan repayment options, if you ever have trouble making a payment on time, you can ask for a “due date adjustment”, to give yourself more time to make the payment. Avant does charge a late fee of $25 on missed payments, but their loans also have a feature called “late fee forgiveness”. This feature is very nice, Avant will refund the late fee, as long as the borrower makes three on-time payments in a row, from the time of the initial missed (late) payment. Avant borrowers can also qualify for a lower interest rate by refinancing their personal loans, an option that can be done twice during the loans life. There are many reasons for obtaining an unsecured loan. Personal loans normally offer lower interest-rates, flexibility, and reasonable loan terms making them a much better option to acquire funding than credit cards. Since personal loans have lower interest-rates and flexible terms they’re great options for refinancing and paying off other high-interest debt. Personal loans can be used for just about anything you want, there’s really no restrictions as to what you use the funds for. Although, a few common uses are home improvements, taking a vacation, paying for college, buying a car, building credit, emergencies, unexpected expenses, health care expenses, paying off debt, or starting a business. An Avant personal loan is a good option for individuals and households to pay down other high-interest debt, like credit card debt. Avant may also be a good option for people with poor to bad credit, and were unsuccessful getting a loan elsewhere. They offer very flexible lending terms, which makes getting a personal loan from Avant a convenient option for anyone. You’ll be able to receive you funding quickly and have your money deposited directly into your bank or checking account. You can quickly and easily find out what rate you qualify for in just a few minutes on Avant’s safe and secure website. Avant does what’s called a “soft pull” when running a credit check, so it won’t affect your credit score.